Designed to protect the casket, the burial vault is commonly required by a cemetery to ensure proper grounds maintenance and to avoid the settling of a grave site. While most are made of concrete, today there are many decorative and personal elements a family can choose to include. If you have questions about burial vaults, or any of the other funeral products you see in our online collection, please call us at 718-296-4343. Often called an "urn vault", a cremation vault is intended to protect the cremation urn when buried. 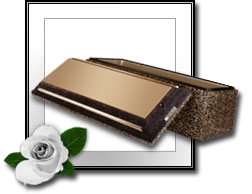 Browse our selection of cremation vaults, many featuring unique decorative elements and personalization options.